Here's a shout out to our medical colleagues at St. John's Regional Medical Center. 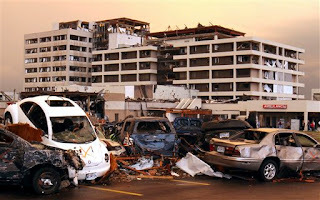 The Joplin, MO hospital suffered a direct hit by a deadly tornado yesterday. As the pictures show, the building suffered nearly complete damage, with blown out windows and tattered roofs. Medical records and X-ray files have been scattered as far as 60 miles away into a neighboring county. The number of dead in the region currently stands at 116. This makes you wonder how prepared you and your hospital are prepared for natural and man made disasters. What happens when the place people look to for medical care after a devastating event is itself disabled? How would you respond as a physician? What do you think you can do without electricity, clean running water, or any equipment so crucial to modern medicine? CT of head or abdomen? Nada. Phone consultation to a colleague? Not if the phone system is down. Emergency surgery for intracranial bleed? No power for anesthesia machines. Pretty grim indeed. The hospitals of New Orleans were also crippled after Hurricane Katrina. The tales of horror that beset the patients and doctors there made national headlines. One doctor was even prosecuted for providing substandard levels of care at the time, as if there is a standard of care when there is no electricity, water, or medicine to treat patients. We doctors everywhere wish our fellow citizens well after this season of unusually deadly twisters. 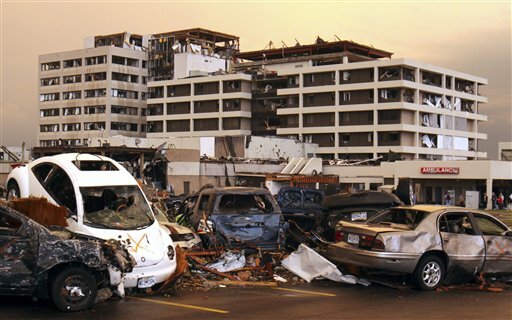 The patients in Joplin are being transferred to all areas around southwestern Missouri, including Springfield, MO and Wichita KS. Good luck and prayers to everybody in the area. I'm not a clinician by any means, but love your blog and just wanted to say thank you for your post on St. Johns. That hospital has some pretty amazing employees and I can't even imagine what they've been thru and are still going thru.